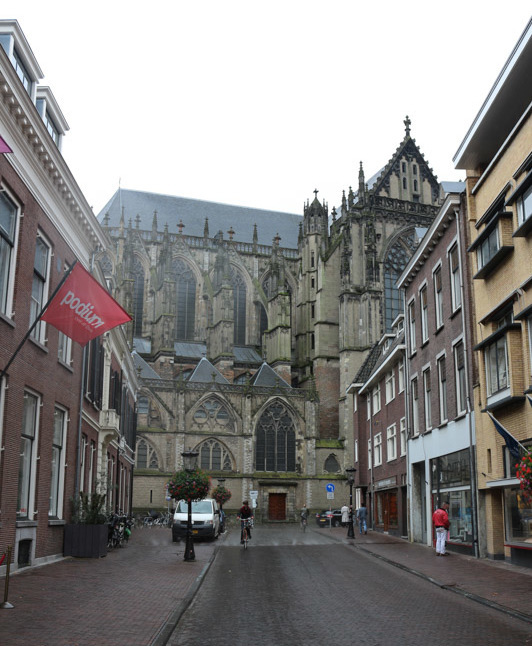 Lonely Planet says that Utrecht is somehow often ignored by visitors. 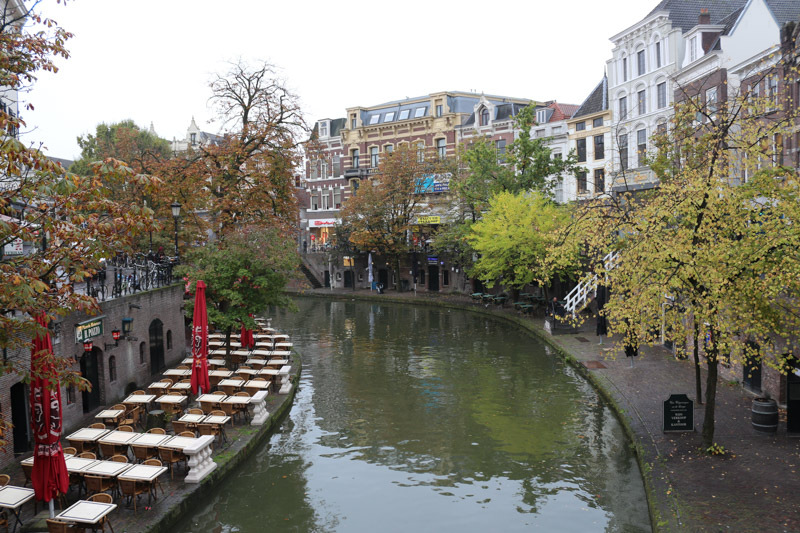 Perhaps it’s the lure of Amsterdam that leads people to forget Utrecht. 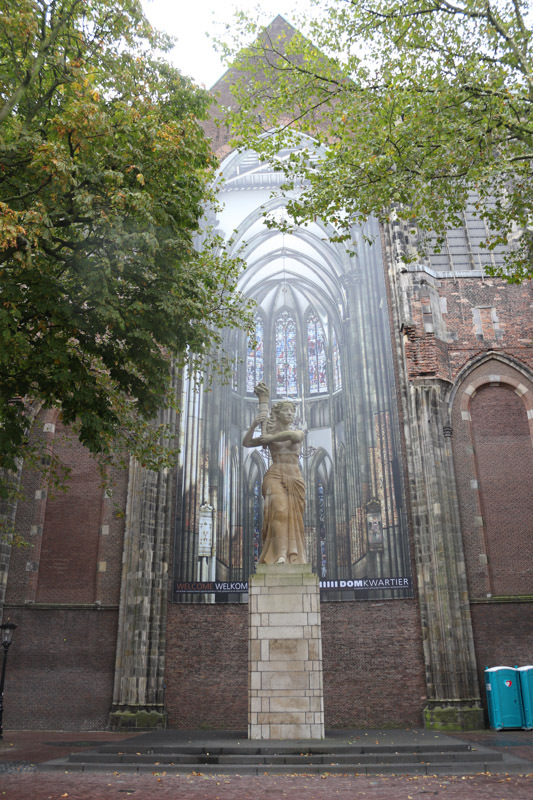 Whatever the reason, this graceful city is bizarrely under-visited. As mentioned above, I was only there for a very short time and it was raining during my whole stay. 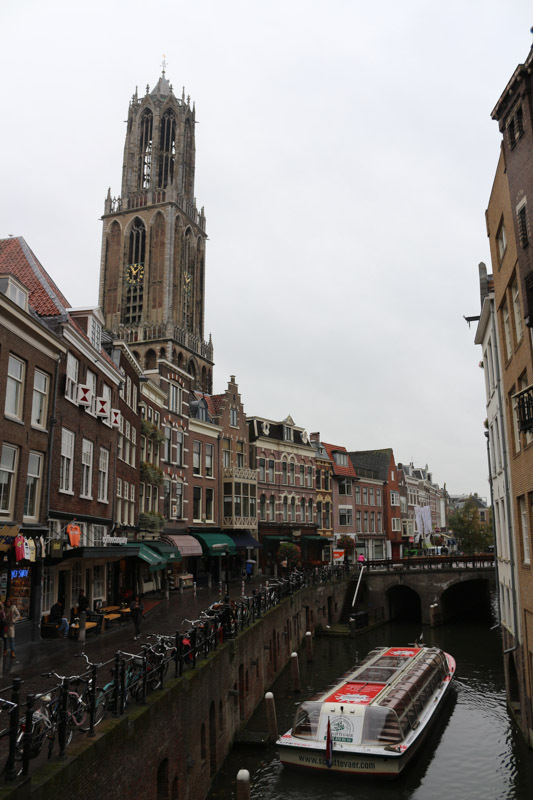 But I found both the cathedral and the canals of the city very interesting. Please apologize the bad pictures. 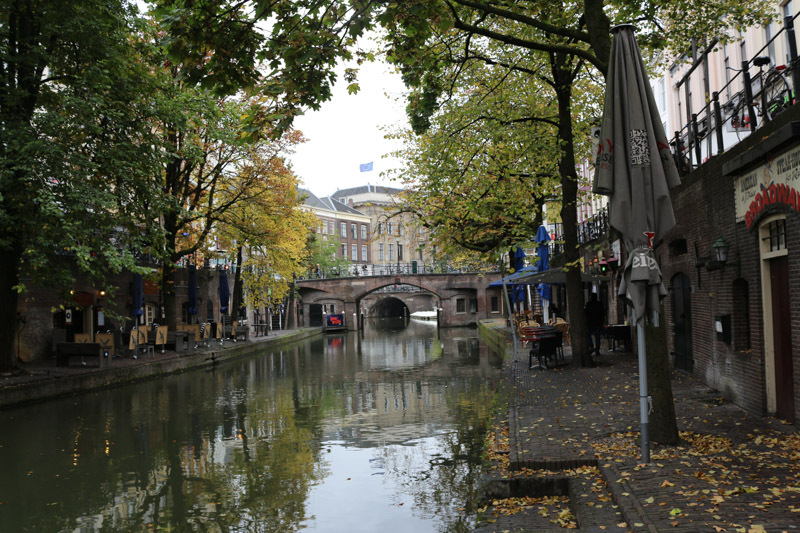 Utrecht is surely much nicer when the sun is shining. 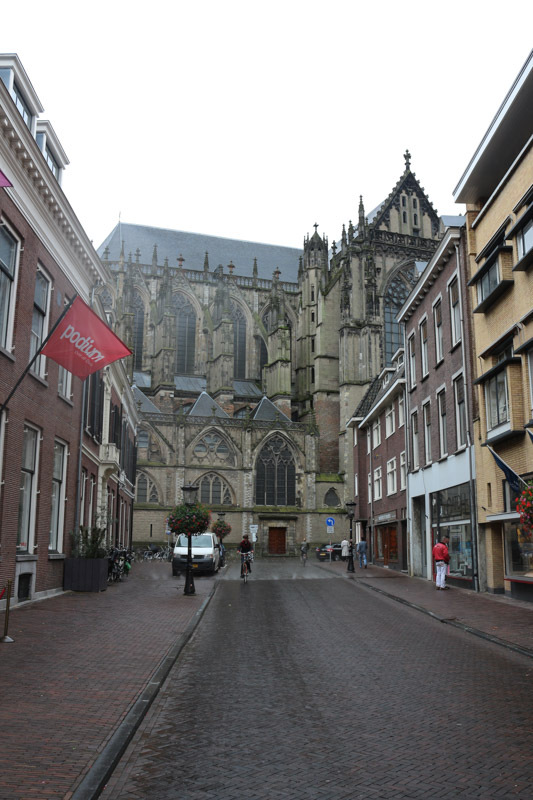 You will notice the tower of the cathedral already from the outskirts of the city. It can be seen from almost everywhere. 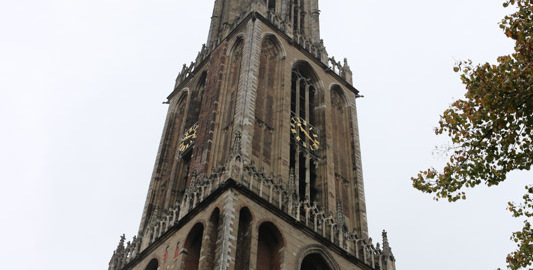 The tower is really big (112 meters) and the construction of the cathedral was started around 1254 in the gothic style. When you come closer to the cathedral everything still looks normal. But then you realize that there are a few very substantial pieces of the building missing. Half of the cathedral is gone. 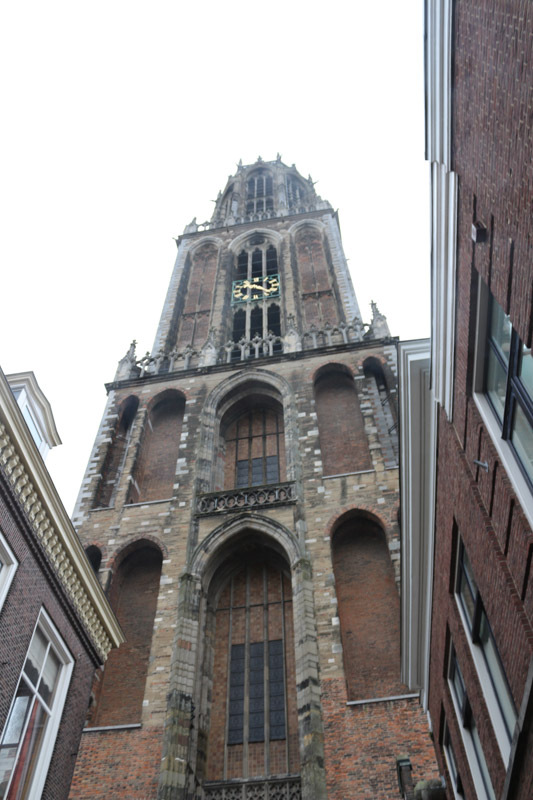 There is a huge gap between the tower and the transept. 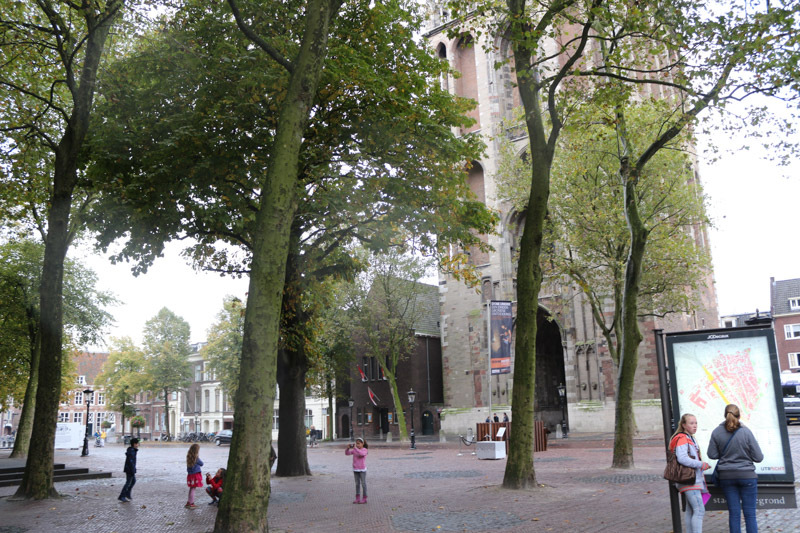 This is now a public square, the Domplein. 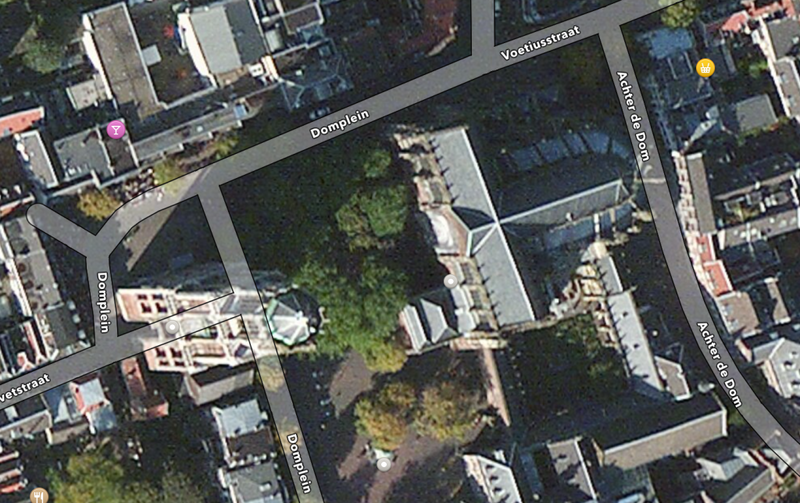 It gets probably even a bit more obvious if you look at the satellite picture. What happened? 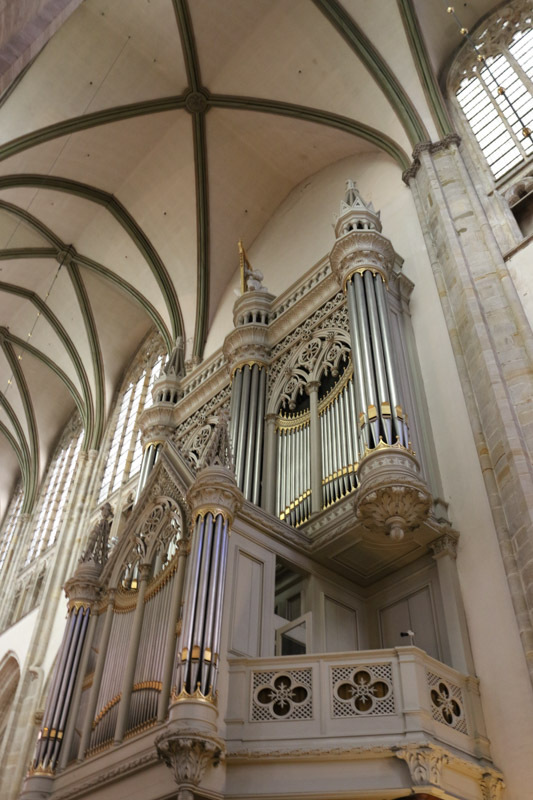 On August 1, 1674 the cathedral was hit by a tornado. The middle section of the nave collapsed. Over the subsequent centuries, much of the enormous building fell into further neglect. The pitiable state of the cathedral led to some small restoration activities in the nineteenth century, followed by major renovations in the early twentieth century with the aim of returning the Cathedral to its original state. However, the nave was never rebuilt. Please also refer to the related Wikipedia article. The main altar area is intact. But to make the building usable again a wall was added at the end of the transept. 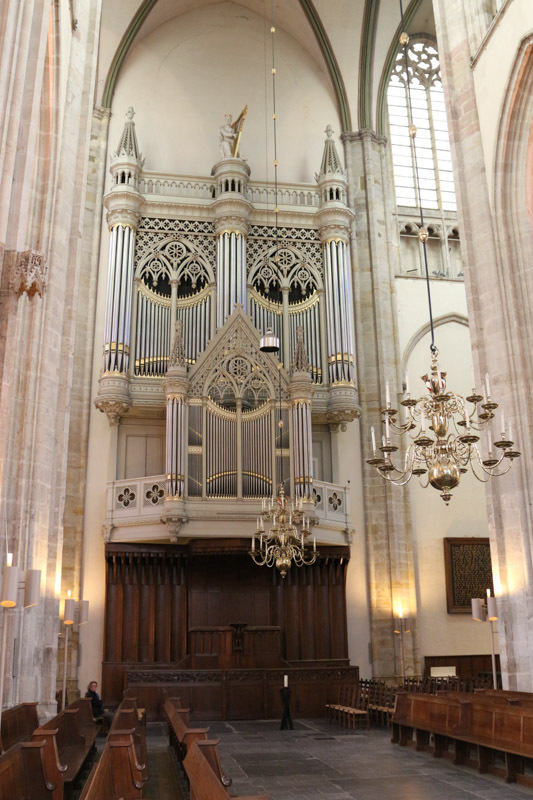 Today the huge organ is hung on that wall. If you are inside the building and just look towards the altar you would not notice this. 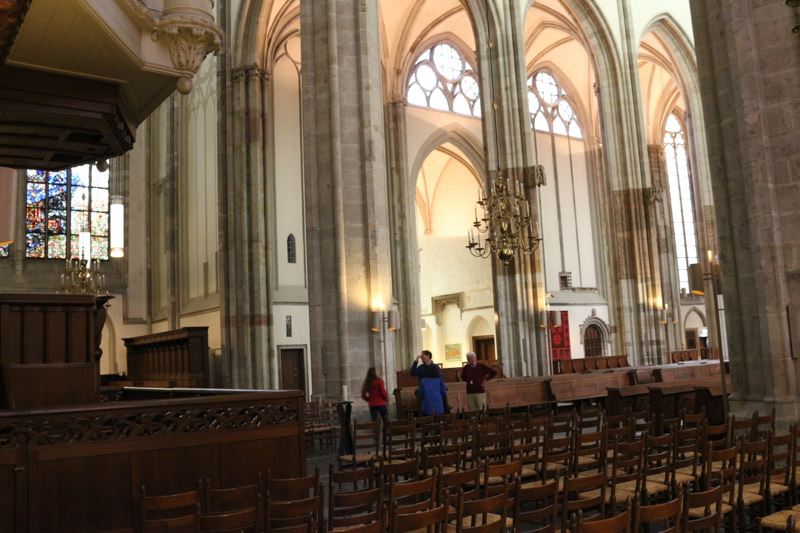 Thanks to the high ceiling and gothic columns it still has an impressive aura. But it is only the mini version of the original cathedral. 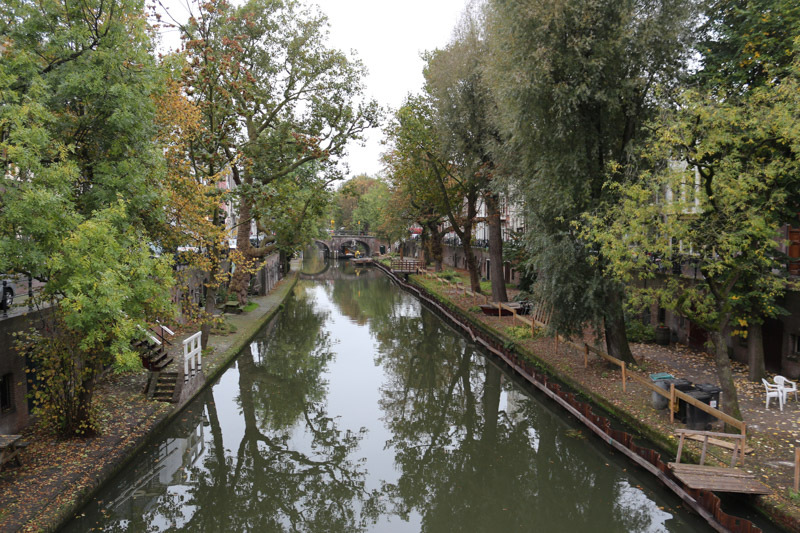 When the city of Utrecht dug the canals surrounding the city center they used a slightly different approach from other other Dutch cities. On the first look it might not be obvious. 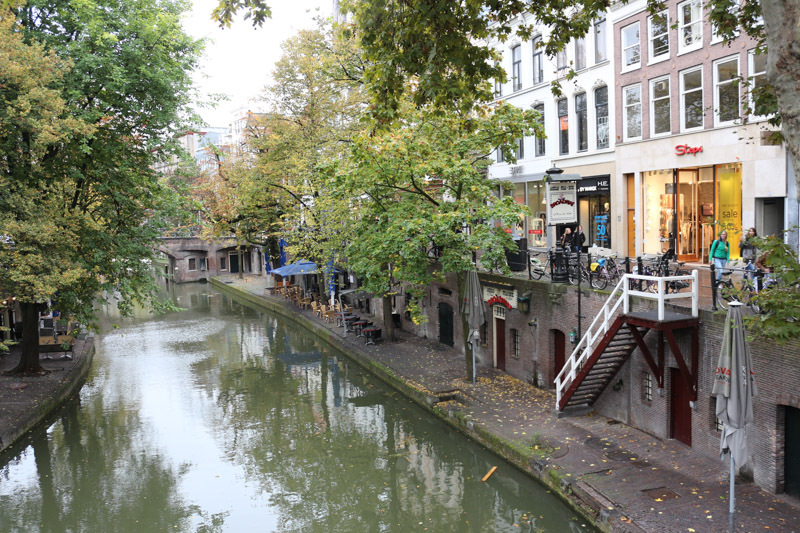 But the canals have two levels. There is the lower section with the wharfs directly on the water level. On each side of the canals these wharfs allow easy loading and unloading of ships. The entrance to the storage rooms is directly on the wharf. The upper section is built above the storage facilities on the water level. Both the street and the house are standing on the ground floor. Therefore customers could easily access the shops and offices without interference with the logistics processes happening on the water level. Today these wharfs are often used by restaurants. They offer a lovely seating area and can be accessed either through the restaurant or the staircases close to the bridges.